especially the older White and Black ones. It is in stock, no waiting. We normally ship this via US Mail. to order a spare ribbon, or two. You will be offered that option on the next screen. Here's how you can tell: Look where the key goes in. If it has a metal surface this is the WRONG Key. 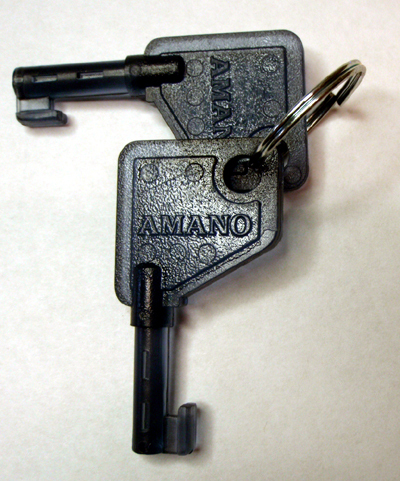 It fits MOST of the Amano PIX machines, but recently things have begun to change. Those machines take a silver metal key with a “700“ stamped on them. We sell that as the TCX Key. Click HERE to get THAT KEY. 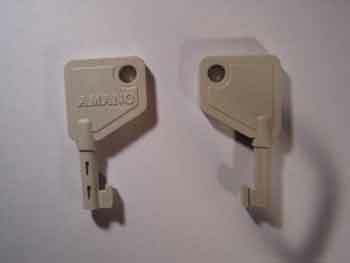 If your machine has a narrow key slot, this is the wrong key. then this is the one. Call us if you have any doubt, do it right. Some people call it a “Church Key“.